Ever heard of the saying “Change the curtains, change a room, change your life”? Okay, maybe we made that up but it does hold true. Even the smallest change of curtains – from a bold print to a soft pattern; loud colors to muted or neutral tones – can transform a room and freshen it up for a new season or special occasion. Take, for example, this space with our Benton Recliner in Paisley. The large jacobean on our Caroline Curtains complements the large pattern on the chair. Our Juliet Panels feature more romantic hues that tone down the pattern for a soft look. The Victoria Panels offer a traditional color tone and flowers that enhances the naturally timeless look of the upholstered chair. Finally, the Dotted Blackout Curtain Panels in Natural gives the space a warm, neutral look and makes the Benton Recliner the center of attention. 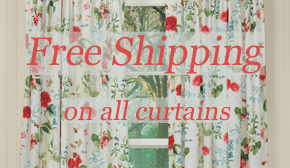 To make redecorating a little easier, we are offering free shipping on select curtains all spring long. Click here for more information. This entry was posted on Thursday, April 6th, 2017 at 8:04 am	and is filed under Apartment, Bathroom, Bedroom, Curtains, Decorating, Dining Room, Quick Tips, Seasonal Decorating, Thematic. You can follow any responses to this entry through the RSS 2.0 feed. You can leave a response, or trackback from your own site.